This is my first review of a light source for photographers, so unless you’re already a professional light-source user, your experience should be similar to mine. The first thing I needed to do with the LED Photo Studio Color Box Light With Infrared Remote Control was mount it onto a tripod, or at least onto the ‘handle’ included in the box, because otherwise the four ‘flaps’ that cover the LED’s are difficult to manage with less than two free hands. One free hand will work when the Color Box is securely on a tripod. While the tripod thread looks strong enough and deep enough, I’d suggest not to over-tightening anything that goes into it, to prevent possible damage. 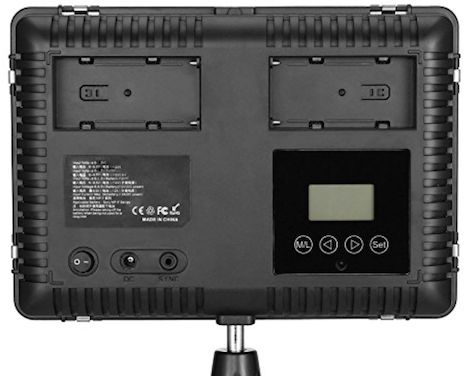 The two most important features of the Color Box are the brightness range and the color temperature range. The color temperature range goes from 3200k (reddish cast) to 5600k (bluish cast). 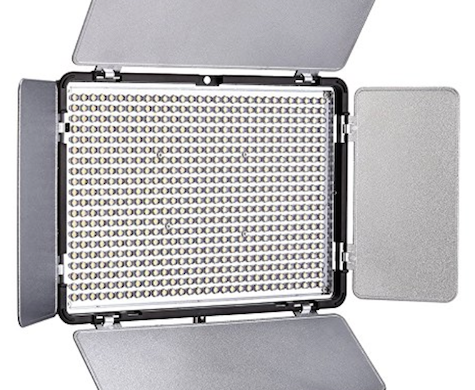 The brightness range goes from 400 lumens to 2200 lumens, using 600 LED’s in a 20×30 configuration. That’s a lot of LED’s, but having owned a number of high-power LED flashlights as well as a couple of photo projectors, it looks like a good design for dispersing heat. These adjustments are made on a small LCD screen, with increase/decrease buttons, and a toggle button for brightness or color temperature. Also on the LCD screen is a battery-level meter. My video review linked below demonstrates the brightness and color temperature ranges, but unfortunately my first video camera compensated by adjusting the brightness and color temperature up and down automatically, making them appear less dramatic. The additional color/brightness demo video should make a better demonstration of those ranges. Still, given the relatively small size (10 x 7 x 1.75 inches) of the Color Box and its large number of LED’s, I was quite surprised by the maximum brightness and its very effective color temperature range. There are other features of the Color Box that I wasn’t able to test, such as joining two or more of these together, and running them with the remote control addressing the ‘master’ Color Box. 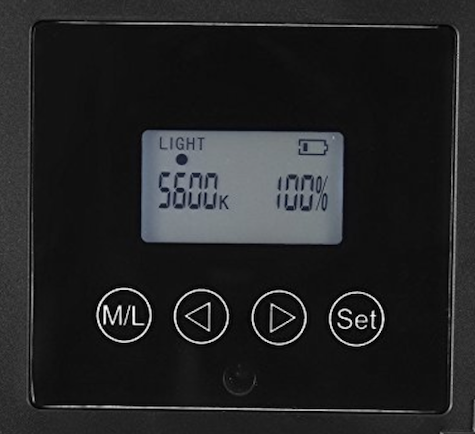 The included remote control will increase and decrease the brightness and color temperature, but did not turn the Color Box on or off remotely. The physical on/off switch on the Color Box performs that function, but there may be additional hardware to allow the on/off to work with a remote control. The Color Box’s build quality is very good — part metal and part plastic, and while it seems rugged enough for typical handling indoors, you wouldn’t want to drop it from a moving car or down onto concrete from several feet up. There are two battery slots, and while I’ve had only one battery for this testing, every test that I’ve done has been on the original charge I did at the beginning. I’d strongly suggest using two batteries when AC current isn’t handy, and expect a few hours runtime, or more if the lower brightness setting is used. Conclusion: For the standard price of $120 USD, the Color Box will be quite the bargain for photographers who can work with a single unit. I can’t say for sure whether it would make more sense to join several of these in a bigger shoot that requires more light, or to just get a larger light source. At least we know that several of these can be used and operated from one controller, meaning you can buy one now and add more later.